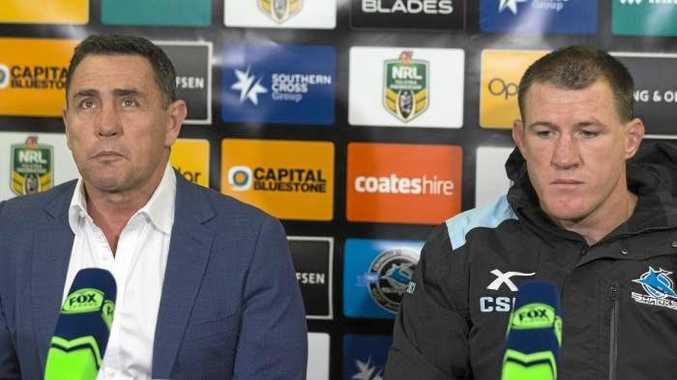 Shane Flanagan and Paul Gallen front the media after the Sharks' defeat. RUGBY league legend Gorden Tallis has torn strips off Cronulla coach Shane Flanagan for his epic referees blow-up on Sunday. And Mark Geyer has issued a dire warning to NRL coaches who he says are driving young officials away from the game. Flanagan launched a sensational attack on senior referees Ashley Klein and Gavin Badger in an extraordinary post-match press conference on Sunday. 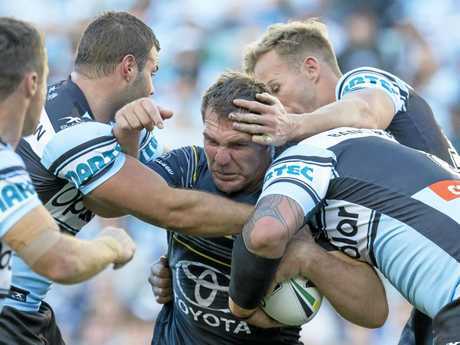 His Sharks were bundled out of finals by a Michael Morgan field-goal for the Cowboys in extra time, but it was the refs who Flanagan blamed for the one-point loss. He took a piece of paper into the press conference and rattled off seven instances in which he believed the referees had made a wrong call. 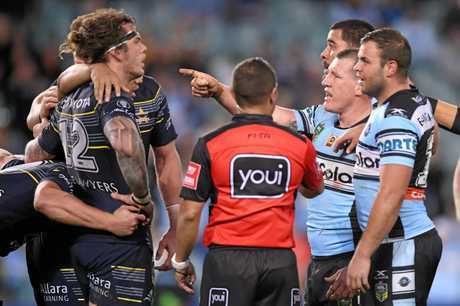 Flanagan's performance left Tallis irate, who took aim at the Cronulla coach on Triple M's Sunday NRL coverage. Tallis advised Flanagan to look at his own team's tactics rather than blame the officials. "Stop your whingeing, you're at a club that's had more bad behaviour than any other I can remember ... cut your loss," Tallis said. "I reckon if you sat down and got an independent guy to watch every game, there's decisions that go either way. "That didn't cost his team the result. "It was five (plays) up for a bomb (kick) for the first 40 minutes of the game. Why doesn't he look at his game plan? "His side missed 37 tackles, they missed 37 and the poor Cowboys only missed 10. But that was the referees' fault too because they let them stand offside all day. "It does not help our game. "That's calculated, he walked in there with a piece of paper ... how is that going to help your side? Seriously. "I'm serious, how does that help? How does that help our game?" Tallis went as far as to say sprays likes Flanagan's are contributing to the declining crowds at NRL games. "He talks about attracting people to the game ... (Cronulla) had 60,000 (members) last year in blue jerseys, but where are they? They're not even coming to watch you guys play," he continued. "For the coach to go down, get the information, ask the CEO can I have a go at these referees ... their own players make mistakes and they can't get up them because they're generation whatever and if I bag them I don't get the best out of them. "Yet they'll bag referees who are the same age. It annoys me." Fellow league legend Geyer was equally livid at Flanagan and Manly coach Trent Barrett, who also blamed the match officials for his loss to Penrith on Saturday. Barrett pointed to two specific calls which he said cost the Sea Eagles victory. Geyer says rants like Flanagan's and Barrett's put the future of the game in danger. "You know what I'm worried about? I'm worried about how we inspire the next generation of young refs," Geyer told Triple M's The Grill Team on Monday. "When every time a team loses they blame the man with the whistle, every game, just about every coach. "You know what I'd like to see? How about a coach comes into the press conference and blames one of his players for dropping the ball, or blames one of his players for giving away penalties. "Refs have become such an easy target and for whatever reason - maybe it's because we've got two of them on the field - we've got to live with the fact rugby league is refereed by humans, not machines. "Referees make mistakes, so do players. Players make mistakes every game." 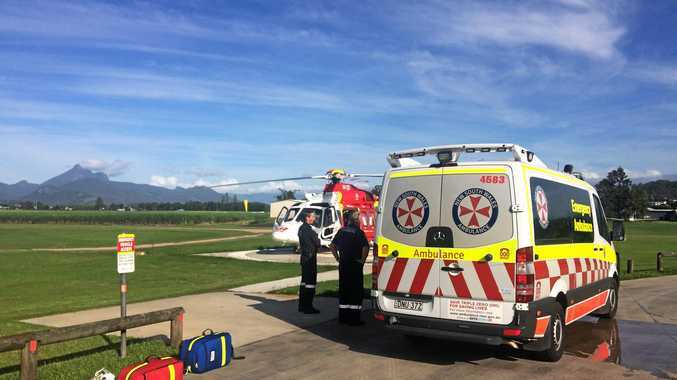 News A WOMAN has been rushed to hospital after she fell from her mountain bike, suffering serious injuries.